You're digging him in this month's issue of DEADPOOL and you want to know more about him? How about his origin story? A troubled soul, set upon a path of vengeance he does not understand. An assassin without equal, trained in the most secret of killing techniques. A flesh and blood specter, haunting the killers of the world. 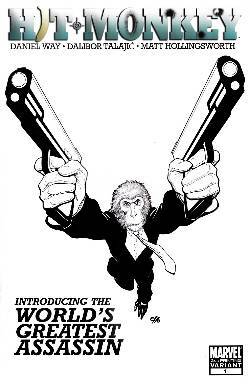 A monkey...with a gun. Bear witness as the legend is born. Hitman Monkey.